You spend a lot of time decorating your bedroom. After all, it is your private space, your sanctuary. You want it to be a relaxing getaway from the hustle and bustle of the rest of your home. While it’s obvious to add accent pieces and artwork, you may be leaving out an important, and useful, decorating component: plants. A warm bath, a cup of decaf tea with honey, and soothing music are all known to induce sleep. But did you know that certain plants can help add to your nighttime relaxation ritual? The scent of lavender has been widely acknowledged as a sleep aid. Artificially scented soaps, lotions, and candles all boast relaxation and sleep powers. The National Sleep Foundation asserts that lavender lowers blood pressure and heart rate to assist in sleep quality. The American College of Healthcare Sciences notes that the aroma of lavender reduces the stress hormone, cortisol, to cause better circulation and aid in relaxation. It is used in baby products to help calm fussy babies, meaning better sleep for both them and their parents. Lavender is a fragrant plant from the Mediterranean region that has been used for centuries as a sleep aid. People used to fill pillows with the fresh-smelling blue blooms and its leaves as an effective method for inducing relaxation and sleep. This beautiful plant not only will improve the style of your bedroom, but will promote better sleep, improve mood, and reduce anxiety. If possible, place your plant near a south-facing window so that it has access to the most sunlight, particularly if you live in a northern region. If the top layer of soil feels dry, water your plant lightly. Do not overwater. Lavender roots are prone to root rot if kept continuously damp. Choose a smaller variety of lavender, as some plants can grow into three feet tall and three feet wide bushes. Not only does jasmine smell wonderfully sweet, it also offers an abundance of benefits. This plant, with its petite white flowers, is native to tropical to temperate regions of the Old World and is believed to have originated in the Himalayas in western China. The fragrance produced by the star-shaped blossoms help with depression, fatigue, stress, and anxiety, making the jasmine plant an ideal choice for your bedroom. Studies have revealed that the scent of jasmine is “as calming as valium.” The smell transmits signals to a region of the brain known as the limbic system, which regulates emotions. In aromatherapy, jasmine is used to help with one’s blood pressure, heart rate, and breathing and is believed to improve immune health. According to the National Sleep Foundation, individuals who slept with the scent of jasmine slept deeper with less movement and reported an overall better quality of sleep. Place plant in a southern-facing window, but keep the room’s temperatures cool. Allow no more than three or four hours of sunlight. Provide a trellis to help this vine-like plant to grow properly. Keep the soil moist, and fertilize with indoor plant fertilizer. Prune in early spring to keep its size small. Rosemary has many uses in the kitchen, from seasoning olive oil to mixing with a marinade to blending in cream cheese and spread on a bagel. But did you know that a rosemary plant in your bedroom might help you sleep better? Rosemary essential oils are also known to help even out your mood, and a plant in the bedroom is thought to improve air quality and improve sleep habits. 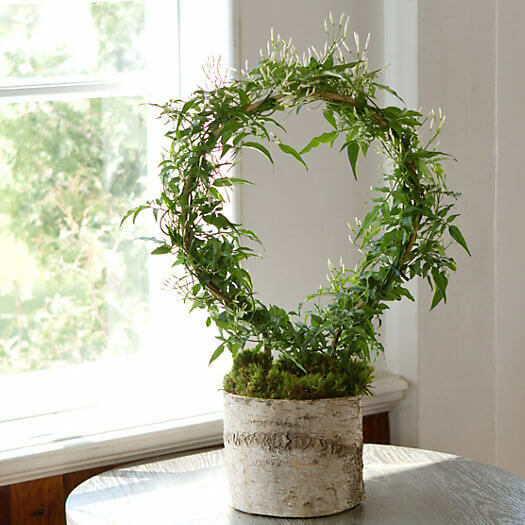 Like jasmine, rosemary can grow into a three-foot by three-foot shrub, so pruning is essential. These plants require approximately six hours of direct sunlight daily. Water your rosemary plant when the soil is dry to the touch and use a slow-release fertilizer in the spring. The viper’s bowstring hemp, also known as snake plants, is a great filter plant that removes harmful toxins from the air. Unlike many plants, the snake plant removes carbon dioxide and releases oxygen. It is particularly helpful for individuals with breathing issues or allergies. 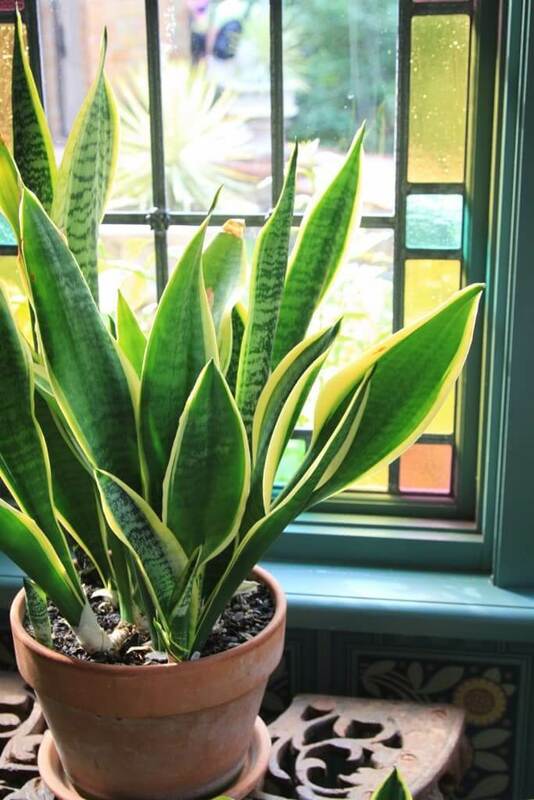 Snake plants are extremely resilient and very low maintenance. They do not require a lot of sunlight. Water every few weeks and wipe dust from leaves. Like the snake plant, spider plants are known to purify and detoxify the air by filtering out airborne pollutants. A NASA study revealed that spider plants and snake plants both can destroy 90% of formaldehyde, a potentially carcinogenic chemical, from the air. It also absorbs odors and fumes. 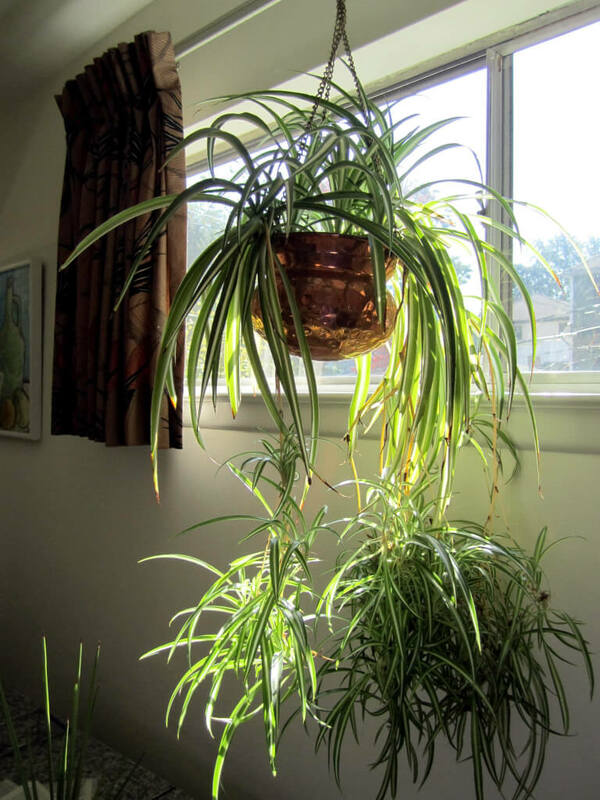 Very resilient and requiring little maintenance, spider plants only need to occasionally need to be watered. It only needs indirect sunlight in moderate amounts. Makes an excellent hanging plant. We spend quite a bit of our home life in our bedroom asleep, so it makes sense to fill your room with plants that will benefit our health. Many houseplants have been proven to detoxify the air you breathe, eliminating pollutants, chemicals, and harmful microorganisms. This not only can improve your overall health, it can help you achieve a more restful sleep. Great tips, especially the Snake Plant and Spider Plant info… we need to get one or two or a dozen of these things. Thanks! Not to nit-pick, but one point of clarification. It didn’t ring true that “Unlike many plants, the snake plant removes carbon dioxide and releases oxygen.” That goes counter to everything I learned years ago in my biology classes regarding photosynthesis and how plants take up CO2 and release oxygen via photosynthesis during the day. Some quick googling revealed that the unique aspect of the Snake Plant is it removes carbon dioxide and releases oxygen DURING THE NIGHT as well, whereas most other plants take up oxygen and release CO2 at night. This makes the Snake Plant the perfect bedroom plant. I love these ideas! Plants for better sleep? Yes, please!